Indulge in the visual and musical soundscapes of Tycho at Urban Lounge on Nov. 3. “Sometimes, you have these ideas, and it’s hard to make them real and get them from your head and out into the real world,” says Scott Hansen, aka Tycho, in an interview with SLUG. The ability to create something—a painting, a song, a piece of clothing, jewelry, whatever it might be—to communicate an idea because it’s the only way that you know how to get it out of your head and into the world, is powerful. The way Tycho expresses his ideas and feelings resonates deeply with a wide audience, which is telling of his intuitive talent as a musician. Tycho’s music reminds me of a soundtrack to a movie I’ve never seen. Watching a car driving down the Oregon coast, windows down, going nowhere fast. Each track is full of a certain softness contrasted by an overwhelmingly emotional sound. The airy notes are created with an array of synths, keyboards, drum machines and compressors. If I could see Tycho’s music every time I listened to it, it would look like a slow-motion show of sunbeams dancing through the trees, exploding stars and bioluminescent fish swimming through the sea. There is something to be said about a song, or an entire album of songs, that makes you feel like your heart might explode. I tend to lump the sounds of Tycho, and how they make me feel, into the same emotional realm as Sigur Rós, Explosions in the Sky or Múm. If you have never listened to Tycho’s first album, Past is Prologue (in headphones), I would suggest doing so. I was introduced to Tycho by my design teacher in college. He was showing us examples of “good design” and had pulled up a few of the works found on Hansen’s blog, ISO50.com, which mainly included ethereal posters promoting these gigs that someone named Tycho would be performing at. While perusing through his blog later that day, “The Disconnect” came on in my headphones via the embedded music player and I was hooked. One thing led to another, and I realized that these two creators were one and the same. Hansen has always been visually oriented and had always wanted to make music, but had no instrument training and wasn’t quite sure where to start. Things changed when he turned 21 and got his first computer. “When I got my first computer was when I really started making music and doing computer–generated design instead of just illustrations,” he says. He started doing graphic design to create covers for the mix-tapes he was making for his friends, and designing posters for the Tycho shows. “I gave design a good decade of my life, and I accomplished a lot of things visually as far as articulating the ideas that I have been working towards for a long time. So, I decided that it was time to do the same thing with music, and I quit doing all freelance work about three years ago just to focus solely on Tycho,” says Hansen, though he continues to create his own album covers, show posters and video graphics. “The project is still audio-visual at the end of the day, so I want the imagery associated with it to be very similar,” he says. 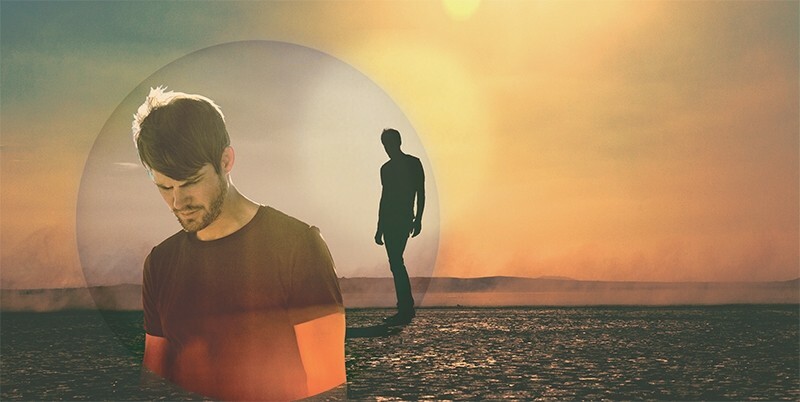 Tycho’s third studio album will be released late March 2014. “There’s a lot of stuff that could’ve sat on the outside of the past record [Dive], but there’s a subtle evolution in the new songs. The album is a lot more driven—it’s a lot more heavy,” says Hansen. Tycho’s touring drummer, Rory O’Conner, plays drums on the album, and Hansen and Zac Brown (Tycho’s touring guitarist), wrote and recorded everything together. “[Zac] has a rock background and is purely a guitarist. With him writing now, it changes the flow. There’s something different going on,” says Hansen. The two met a few years ago, through fellow musician, and Brown’s cousin, Dusty Brown. Hansen invited Zac to a few shows and they would spend the night freestyling through songs. “I always heard guitars in my music, and I had always wanted to add something like that,” says Hansen. Zac came in later on in the recording process for Dive, and created the track “Ascension” together with Hansen. Zac also played guitar on the title track. “Now I really enjoy performing and having other people up there and being able to create the music in a more live way than with just one person,” says Hansen. Tycho will be playing at Urban Lounge on Sunday, Nov. 3. I had the opportunity to see them perform last summer and 10 seconds in, it became one of my favorite shows of 2012. From the video graphics designed by Hansen to the music, it was an experience in and of itself. “This will be the last chance to see us play any of the old material the way we did last year. The new material is a lot more complex on the live instrumentation side, so it will be an interesting experiment to see how we’ll pull that off live,” says Hansen. Discover more Tycho at tychomusic.com.